This is the first year McDonald is leading the event as party leader. 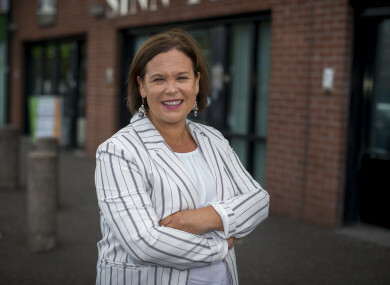 Sinn Féin Mary Lou McDonald is holding her first think-in since she was made president of the party. THERE WILL BE change in the air at this year’s Sinn Féin think-in, as Mary Lou McDonald kicks of proceedings in Cavan today. This is the first year she is leading the event as party leader, which will have members of the parliamentary party, MLAs and MEPs all in attendance. Last year, Gerry Adams used the gathering to announce that the party wanted to be in government and that there should be an orderly leadership change, which has now come to pass. Party think-ins are held by all political parties each year ahead of the Dáil resuming in the autumn. Politicians use them to talk through party plans and ambitions, as well as discuss what their priorities are for the year ahead. The media attend to get a jump on some of the expected talking points for the months ahead. While politicians want to get out the party’s narrative about the future out to the public, this can sometimes backfire – as both Fianna Fáil and Fine Gael know all too well. Cast your mind back to 2010 when the then-Taoiseach Brian Cowen was criticised for an interview he gave to RTÉ’s Morning Ireland. It resulted in Simon Coveney, who was just an opposition TD at the time, calling him out on Twitter. While last year, Taoiseach Leo Varadkar had his own slip-up when he was heavily criticised for comments he made to this website insisting that Ireland has “one of the lowest levels of homelessness” despite a record number of people living in emergency accommodation. His remarks dominated the news cycle for the following two weeks. Sinn Féin, under the reign of Gerry Adams, was always perceived somewhat as a closed shop. However, with Mary Lou at the helm, it appears the party is attempting to become more open and approachable. However, only time will tell if this is the case. She has been recently criticised for flip-flopping on remarks she made about it not being the right time for Irish unity in light of Brexit. McDonald has denied doing a u-turn on the issue in an interview with this website. This year, Sinn Féin members are coming together to plan, discuss and debate the party’s “vision of a new Ireland – what that means in terms of Brexit, the economy and Irish Unity”. Over the course of the two days, party reps will discuss the upcoming budget in the 26 counties and how Sinn Féin’s alternative budget might “bring about shared prosperity, lift the burden from ordinary people and address the health and housing crises”. The party will also discuss the latest attempts to get the political institutions in the North back up and running, while also highlighting the issue of rights in the north. A spokesperson for the party said the north is at a “crucial juncture both in the context of Brexit and in the ongoing efforts to resolve the current political impasse. Human rights are non-negotiable”. The party is also set to discuss the closure of post offices around the country, as well as the upcoming Budget. McDonald will deliver an opening address this morning, and deputy leader Michelle O’Neill will close the event tomorrow. Email “Mary Lou's first Sinn Féin think-in as leader to focus on Irish unity, Brexit and post offices”. Feedback on “Mary Lou's first Sinn Féin think-in as leader to focus on Irish unity, Brexit and post offices”.